Flying Start to LiteracyTM is an award-winning, highly flexible classroom resource that scaffolds students from shared reading to small group reading and ultimately to independence through best teaching practice and a solid grounding in reading research. Lift Off to Literacy is the shared reading component of the program, providing pre-readers with the conceptual and foundational skills necessary for a gentle launch into literacy. Then, Flying Start to Literacy nurtures students across nine developmental reading stages (Early Emergent through Advanced Fluent) by its innovative use of thoughtfully linked pairs of books. Each of these pairs (one each narrative and one informational) are connected by their shared high-frequency words, content vocabulary, and—especially—the big idea that unites them. This compelling structure provides countless opportunities for students to make connections while thinking and talking their way purposefully through texts. Click Here to go to Program Components. Key vocabulary is introduced systematically. Key vocabulary is carefully introduced and constantly revisited. Paired books present the same key vocabulary in different text types. High-frequency words have a high rate of repetition with a low ratio of unfamiliar words. Paired books present the same high-frequency words in different sentence structures and text types. 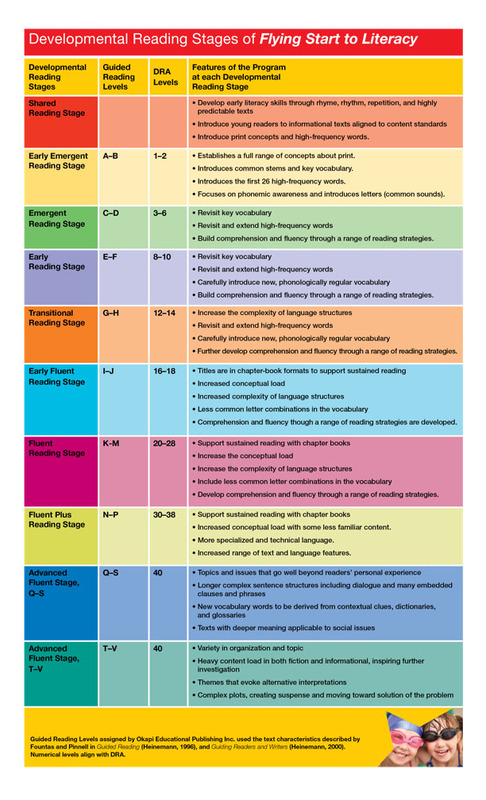 A variety of text types enable the development of a range of reading strategies. Text types with different structures and text features build reading strategies for texts that have different purposes. Text complexity is carefully sequenced to build reading strategies. Flying Start to LiteracyTM is sequenced into 7 Developmental Stages. Reading strategies are developed and consolidated at each level. The teaching of phonics and phonemic awareness is supported by the program. Underpinning Flying Start to LiteracyTM is a systematic and explicit sequence of phonemic awareness and phonics. This sequence is matched in the books to provide a context for learning. 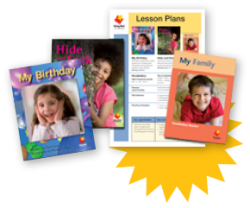 Lesson Plans provide opportunities for oral reading and include the re-reading of books to improve word identification skills and comprehension. Reading and writing are linked. The range of text types and the pairing of narrative and informational texts provide models of writing for the readers. Comprehensive Lesson Plans include writing as an integral part of each lesson. Assessment is ongoing to inform instruction. Ongoing assessment forms part of each teaching sequence. Click Here for further information on the features of the program at each Developmental Reading Stage. Click Here for the complete Research Base to Flying Start to Literacy by Susan Hill.